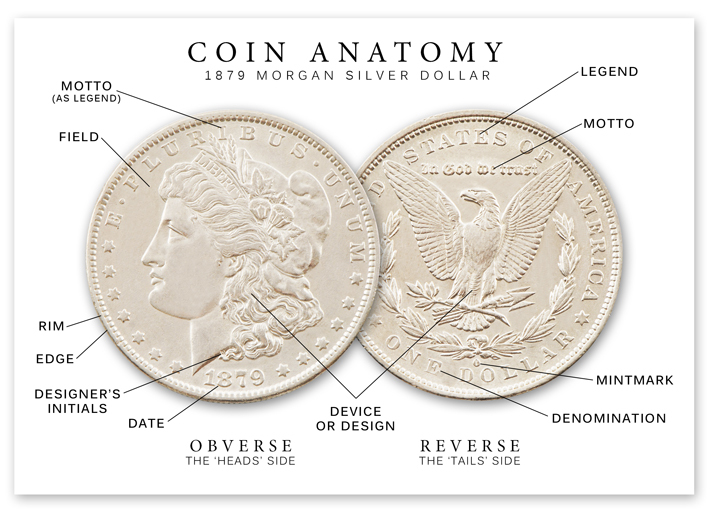 Coin Anatomy The Most Trusted Name in Collecting! DEVICE - The principal element, such as a portrait, shield or heraldic emblem, of a coins reverse or obverse design. DENOMINATION - The different values of money. U.S. coins currently are made in the following six denominations: cent, nickel, dime, quarter, half dollar and dollar. EDGE - the outer border of a coin, considered the "third side" (not to be confused with "rim"). Some coins feature lettering, reeding, or ornamental designs on their edges. ENGRAVER or DESIGNER - the person who engraves the design of a coin onto the die. FIELD - the flat areas surrounding the raised design elements on a coin. MINT - A) the Government Branch where coins are printed, B) Uncirculated (brand new), or C) the act of making a coin. MINTMARK - Symbol, letters or monogram that indicate the mint where the coin was struck. MOTTO - a word, sentence or phrase inscribed on a coin to express a guiding national principle. For example, "E Pluribus Unum" inscribed on all U.S. circulating coins is Latin for "out of many, one." OBVERSE - the front of a coin. REVERSE - the back of a coin. RIM - Raised border around the circumference of a coin.